Fruit Acids. Plant Stem Cells. Powerful Peptides. Protective Antioxidants. These effective ingredients aren’t just for the department store and the conventional skincare counters. Welcome to the new face of advanced natural skincare, powered by some mad hippies. Or, just, by Mad Hippie, an impressive, affordable, clean skincare line available at health food stores and online. At first flowery glance — and with a name like “Mad Hippie” — it’s easy to dismiss this natural beauty brand as something that’s for “the masses” or for those who want to get clean, but don’t really think about marrying modern science with natural remedies. Oh how wrong would your eyes be. 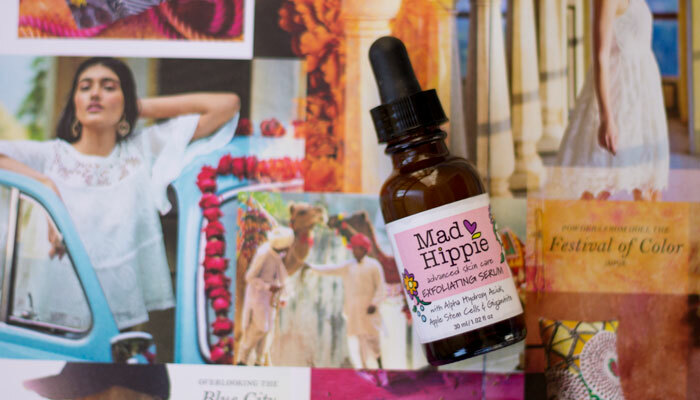 Mad Hippie is one of those brands that has figured out how to make clean beauty accessible, fun, results-driven and, most important, affordable to those who want to overhaul their conventional beauty routines but don’t want to go broke during the process. Case in point: Everything in the Mad Hippie line costs less than $40. Matrixyl Synthe ’6: Peptide that stimulates the synthesis of six major constituents of the skin matrix and dermal-epidermal junction (collagen I, III, IV, fibronectin, hyaluronic acid and laminin 5). Thanks to the generous amount of alpha hydroxy acids in Mad Hippie’s Exfoliating Serum, this product works swiftly to break the lipid bonds that hold on the outer layer of dead, dull skin, revealing brighter, more radiant skin in just a few weeks. As you smooth it onto your skin, you will notice how active the serum feels. It’s not painful, but it is powerful — those are the acids at work. I recommend spot-treating yourself first, or only applying to areas of your face that need some help with discoloration or de-clogging. For a point of comparison, I would say that Marie Veronique’s Gentle Retinol Serum and KYPRIS Moonlight Catalyst evening treatments feel less intense than Mad Hippie’s Exfoliating Serum. To me, Marie Veronique’s is the most gentle, with KYPRIS being in the middle-activity level and Mad Hippie feeling the most intense. This comparison is only for sensitivity considerations; it is in no way a comparison of which product is best! I used Mad Hippie Exfoliating Serum for four weeks straight and noticed after about week two that my skin appeared more even, brighter and seemingly poreless. This is one of the first nighttime treatments I used that delivered such quick results! My oily, acne-prone skin could handle having Mad Hippie’s Exfoliating Serum massaged on all over (because I wanted to combat clogged areas in my T-zone and chin while brightening my sometimes-dull cheeks). The tingling subsided after a minute and didn’t leave me red or flushed. 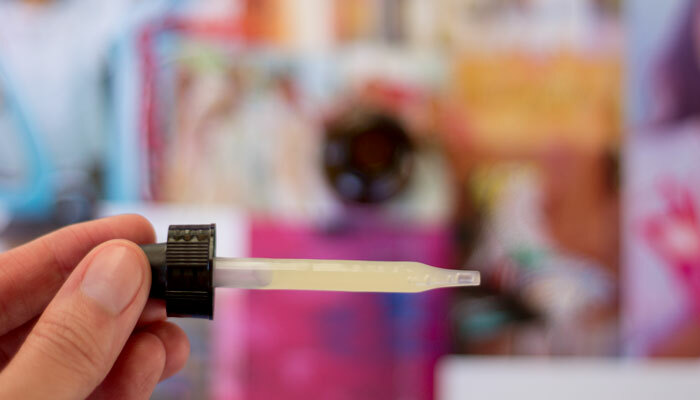 This serum, paired with an oxygenating nighttime beauty oil, kept my skin deeply cleansed and luminous without stripping it of ample hydration or softness. I think that, after the initial month of use and time for my skin to adapt to Mad Hippie Exfoliating Serum, it would be easy to just use it every other night or even once a week as a deep exfoliating serum while I continue to use gentle retinols and vitamin A serums regularly. Because of the quick results, affordable pricing and smart ingredients, Mad Hippie Exfoliating Serum is definitely on my repurchase list. As I continue to explore evening serum treatments for deep exfoliation and advanced protection and renewal, Mad Hippie will likely be an anchor in my soon-to-be-established beauty routine now that I’m six months to 30 and really want to have a set regimen. Have you tried anything from Mad Hippie? What, if any, nighttime exfoliating serums do you use? What does your bedtime routine look like? Tell me in the comments section!